Having recently installed an end-fed 10m long wire antenna, the problem I was facing was feedline radiation, or RF into the shack. I knew this was happening because a touch-operated desk lamp would come on and off and I transmitted, which was most annoying. I needed to build a 1:1 choke balun. So I did a quick search on the internet an arrived at the page of K8DNS (http://www.k8dns.com/balun.html). After collecting the various pieces of gear I would need (thanks Wal VK4CBW for 21 feet of RG58), I proceeded to build this simple choke. I held the coils in place with zip ties, then soldered on the PL259 connectors. All ready for connecting up to my end-fed antenna at the feedpoint. I connected it up to the end fed 80-6m portable HF antenna matchbox system, the UJM-150 that I purchased from Nelson Antennas and put it to the test. All in place and ready to operate. Initial tests were disappointing: my touch lamp still turned itself on when I transmitted a test signal. Undeterred, I then added two ferrite chokes to the antenna feedline inside the shack and this solved the problem. One of the ferrite choked taped to the antenna feeder. The other thing this new setup solved is my ability to tune up on 80m! Andrew (VK1AD who used to be VK1NAM) and I activated Mt Goorooyarro (yes, say that with your teeth out!) 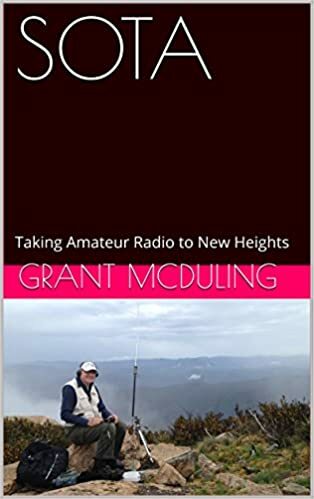 which lies on Canberra’s border with New South Wales the other evening and it was up there that I made my first real DX contact with my Elecraft KX1. But let me start at the beginning and save the juicy bits for later. Mt Goorooyarro (VK1/AC-036) has an altitude of 872m and comes with only one SOTA activator’s point as a result. But don’t let this minimal number fool you; it lies on private property behind a locked gate with a sign warning visitors to keep out as there are unexploded ordinances there. This area, you see, used to be a military firing range and even today it borders on a range that is still in use by the military. We had permission as long as we kept to the track to the top. So we parked the car on the dirt road near the gate, hoisted our backpacks on and made for the gate. It was an easy matter to climb over, but not so easy to keep our eyes from that warning sign. That sign! Scaling the gate backwards was the way to go. The walk up to the summit took about 45 minutes with the going ranging from easy to pantingly tough. But we did pass some interesting sights. We did wonder how these old cars got there. Andrew with one of the many ant hills we encountered. Once on the summit, we set up our stations and set to work. Now for that juicy bit I alluded to earlier. I heard Bernard, F9IE calling on 14.028 CW and as no one responded, I did. And he answered! We had a lovely, longish QSO, which was my first SOTA DX contact. My station consisted of the Elecraft KX1 putting out 1.5W and a Buddistick vertical antenna. Then I worked a JA station (JL1MUT) but conditions were noisy at his end. That got me thinking about the magic of QRP. Think of it this way: if 100W gets you a S9 reading on someone’s S-meter, what will that same meter read you if you were, like me, putting out a meagre 1.5W? Here’s the thing: it takes four time the power to move the S-meter one S unit. So going the other way, it takes a signal four times as weak to move the S-meter one S unit down. So if 100W registers an S9, 25W will register S8, 6W will register S7 and 1.5W will register S6. Remember, we are reducing power by a magnitude of four each time. 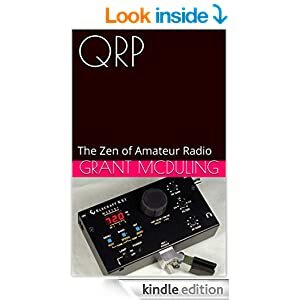 So is life really too short for QRP? One of the aims of the John Moyle Field Day is to test your ability or readiness for portable operations. This is an even I like to take part in as it not only allows me to prepare for remote operations, it also guarantees contacts. This year as always, I prepared my kit, made a check list and ensured I had thought of everything. My mode of operation would once again by CW only on the HF bands. My rig of choice was my Elecraft KX1 and my antenna my new Buddistick. My location would be up on Mt Coot-tha, which is not very far from my QTH. This year I took the added precaution on including a few backup options, and boy was I glad I did. These included a long wire antenna, extra batteries and a multi-tool. When I reached to top of Mt Coot-tha, I found an unattended BBQ area off the side of the road near the Channel 9 TV studios. Perfect. There was a nice table and bench seat provided too. I unpacked my gear and started by assembling the Buddistick antenna. Bugger, I had left the all-important antenna mast and stand at home in my haste to get going. And worse still, it had the mounting plate still attached so I couldn’t make use of the small tripod that came with the Buddistick. Thank goodness for the long wire antenna. I proceeded to cast the end of it up over a high branch of a nearby tree but the weight at the end of it twirled around the branch a few times causing the thing to become stuck. I wasn’t able to pull on it and raise the wire antenna up into the tree. There was now nothing for it but to cut the line loose and try again. Second time around was more successful. The stand I made to keep the counterpoise off the ground. The rest of the station deployed easily enough and I was able to get a 1.3:1 SWR reading using the new inbuilt antenna tuning unit in the KX1 on the 40m band. No such luck on 20m; 7:1 was the lowest I could obtain and there was no time to fiddle with reducing the length of the wire. I needed to make contacts and score points. In total I operated for three hours and chalked up eight QSOs, mostly with VK2 stations. So considering I was only putting out a tad over two watts, I was more than satisfied. Oh, the new paddle worked fine too, even though I found it to flex a little too much for my liking on the enclosure, resulting in some errors in sending. But all in all, I was satisfied. Now to wait for the results. At least I have learnt the lesson about being prepared and taking contingencies into account. I have noticed that activity on the HF bands has been very poor over the last few months. So much so that I hear absolutely nothing on 80m and minimal DX on the other bands. Tom Harris is Executive Director of the International Climate Science Coalition. Dr. Madhav Khandekar is a former Research Scientist with Environment Canada. This got me thinking. If their predictions are correct, we can expect reduced HF activity. However, I have also noticed that VHF/UHF FM activity seems to perform okay. This, together with the notion that technology is fast evolving, I think I will look deeper into C4FM technology. This is basically a digital FM mode that allows for the transmission of voice as well as date communications, using commercially available equipment. In the amateur radio domain, Yeasu have just launched a range of transceivers that I plan to purchase, once I have sold off my HF gear to make space on my workbench. When I heard that Dave Banson had announced his decision to close Small Wonder Labs, I decided to press my Rockmite 80m rig back into service. So I connected it up to my long wire antenna and turned it on. What I heard was a local commercial station booming in real loud. And no amount of tuning would get rid of it. I even connected up my NesCaf filter to see if that would do the trick, but it didn’t. I consulted the rig’s instruction sheet once more and sure enough, Dave had foreseen this problem and suggested a fix. All that was needed was to install a 1K resister into the two unused pads immediately below D1/D2 on the PCB. That called for the PCB to be removed from it’s nice enclosure, an Altoids tin. The PCB safely removed from the Altoids tin enclosure. The two unused pads can be seen below the two diodes on the right (middle) edge of the board. Once the resister had been soldered into place, it was just a matter of putting everything back together again. Everything back snugly in the Altoids tin and ready for use. So how did the rig now perform? Nicely, although the offending station is still slightly audible. But not enough to bother me. I must add that some nights I can’t hear it at all. All I now need is a QSO. I call CW every evening in the hope of a contact but so far this has proved elusive. The 397mW output makes this a challenge, but this is what the fun of QRP is all about. It will come.